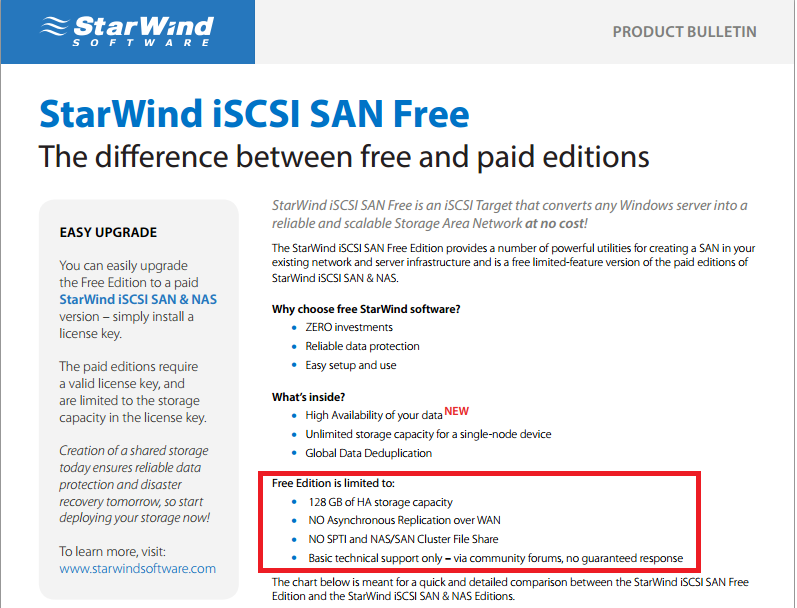 StarWinds offer a free iSCSI SAN that can be installed on a Windows Server to provided an iSCSI target for VMware ESXi 5.5 hosts. This can be good if you are labing vSphere, and you need some shared storage. 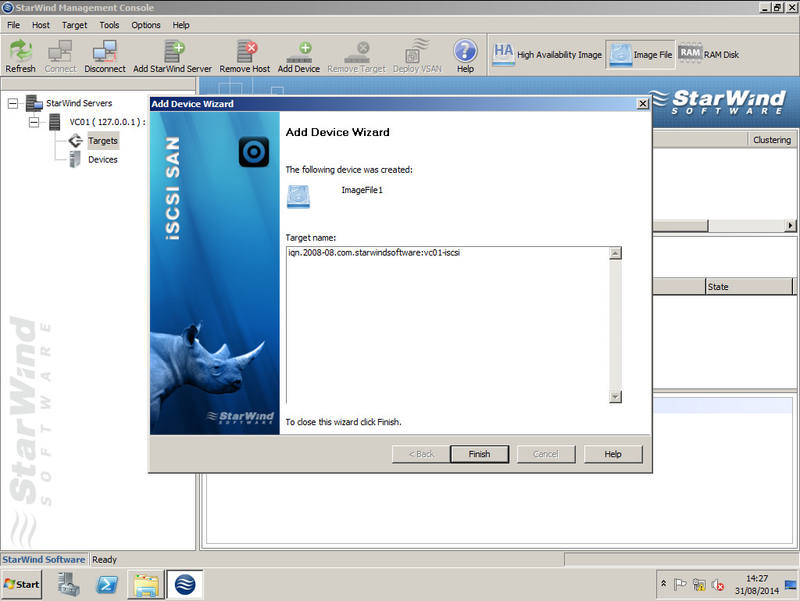 http://www.starwindsoftware.com/downloads-free. The free edition does have some limitations, the most restrictive is probably the 128GB limit on your LUN's. This is OK for a lab, as you probably would not use a software-based iSCSI target in a production environment. 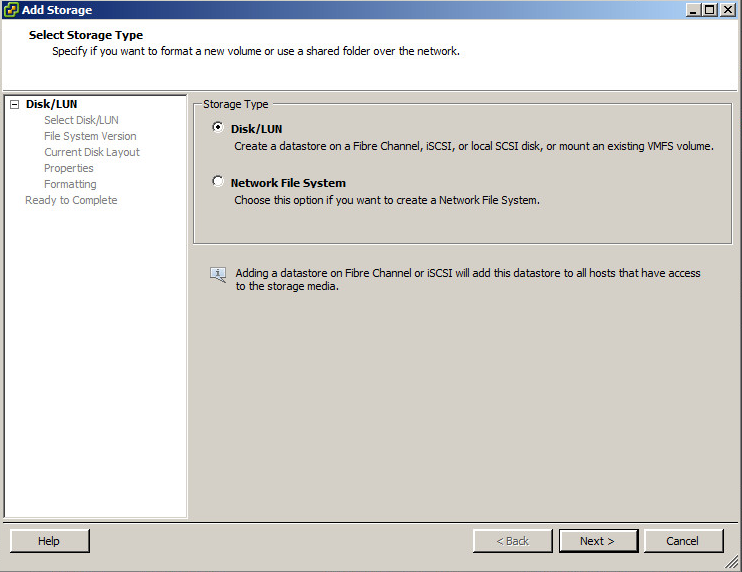 Once you have downloaded the iSCSI executable, install it on a Windows Server. 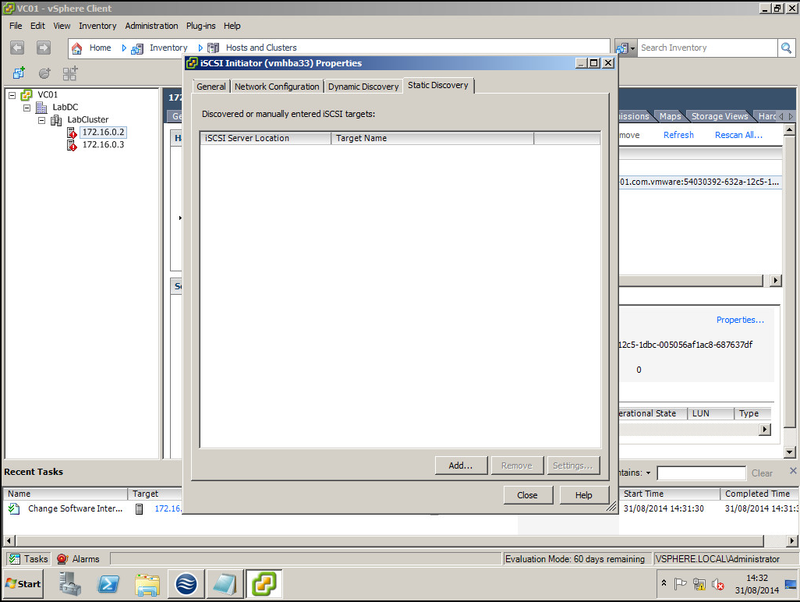 As my environment is entirely nested I added another Virtual Disk to my vCenter Server (again you would never do this in production) to store the iSCSI Image File. Now use the ... button from the wizard, and point to your partition that is going to host the Image File. You must name the Image File, and ensure you have .img extension on the file. I have set the size to 75GB, click Next. Tick Asynchronous Mode and click Next. Select Write-back Caching and then click Next. 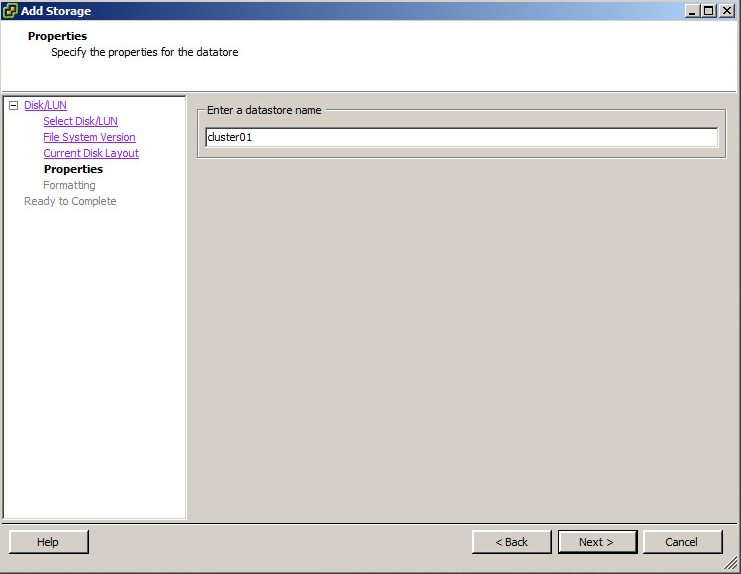 As this is a new installation choose Create a New Target from the drop down and give the Target Alias a name. You should ensure Allow Multiple Concurrent iSCSI Connections (Clustering) is ticked, if you are planning to connect up multiple ESXi hosts. Click Next. 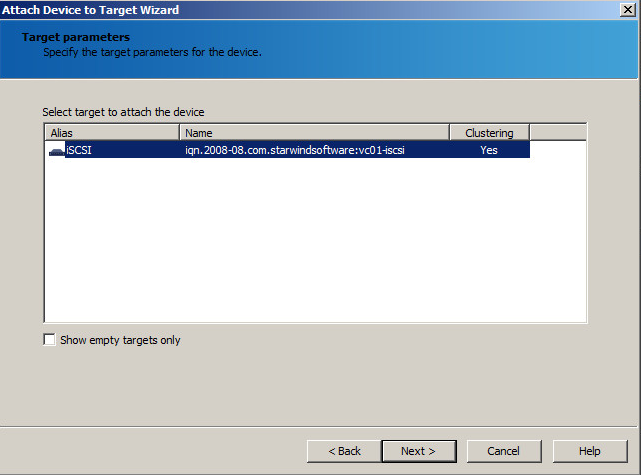 Copy and paste the full target name to Notepad as it will be required in vSphere. Click Finish. Click Attach to the Existing Target click Next. 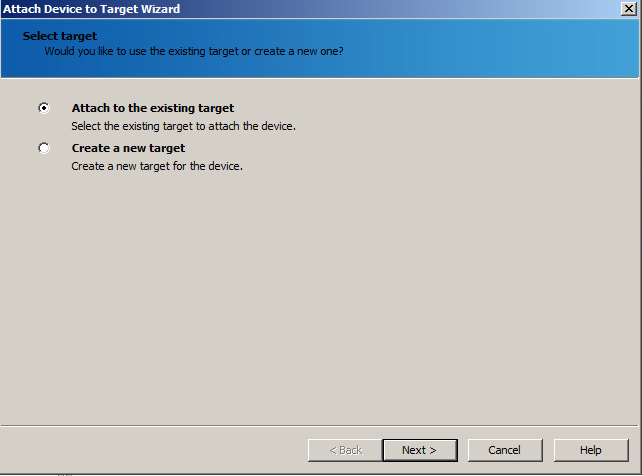 Select the target that you created, I named mine iSCSI. Click Next. 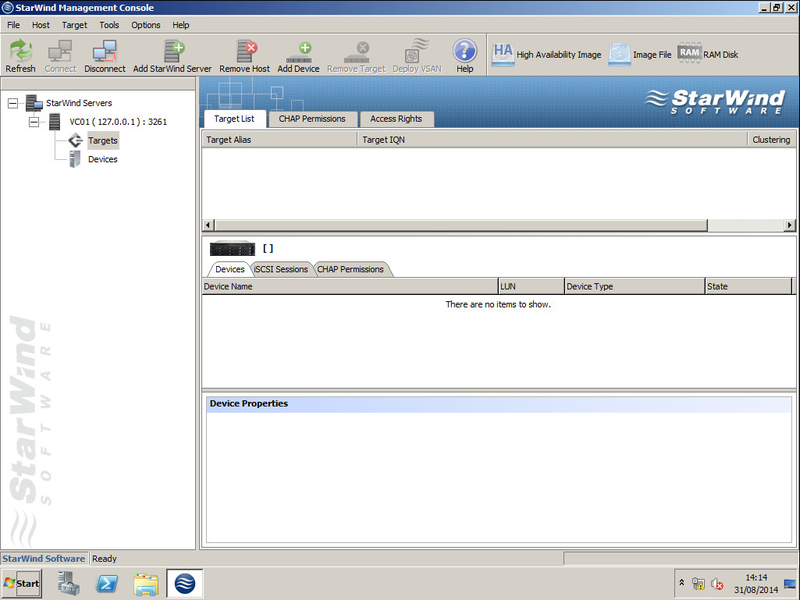 The StarWinds iSCSI software is now configured, open the VMware vCenter console and select one of your ESXi hosts. 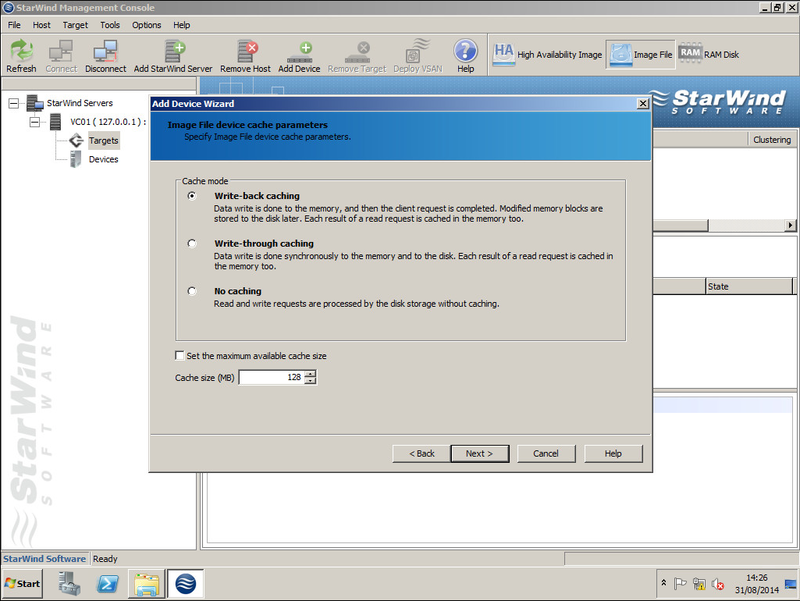 Click on the Configuration tab, and click on Storage Adapters. Click Add. You will be asked to Add Software iSCSI Adapter click OK. Once the software iSCSI HBA is installed on an ESXi host it cannot be removed. 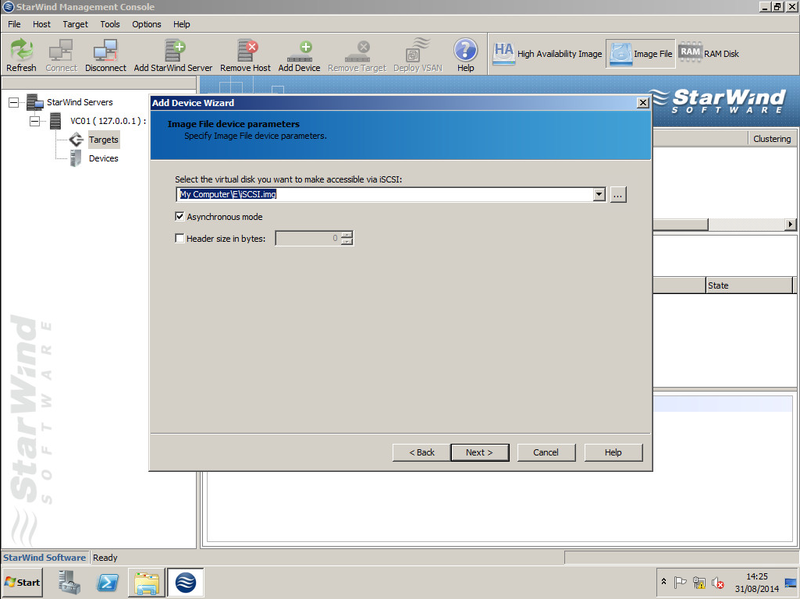 Once the operation completes right click on the Software iSCSI HBA and select Properties. Click on the Static Discovery tab, and click Add. Enter the IP address of your iSCSI server, provided you have not changed the port it should be 3260, and copy and paste the iSCSI Target Name from your Notepad document. Click OK.
vSphere will then confirm that it is now going to rescan all of the HBA's, click OK.
Now click on the Storage tab, and use the Add Storage... button. Select Disk/LUN and click Next. 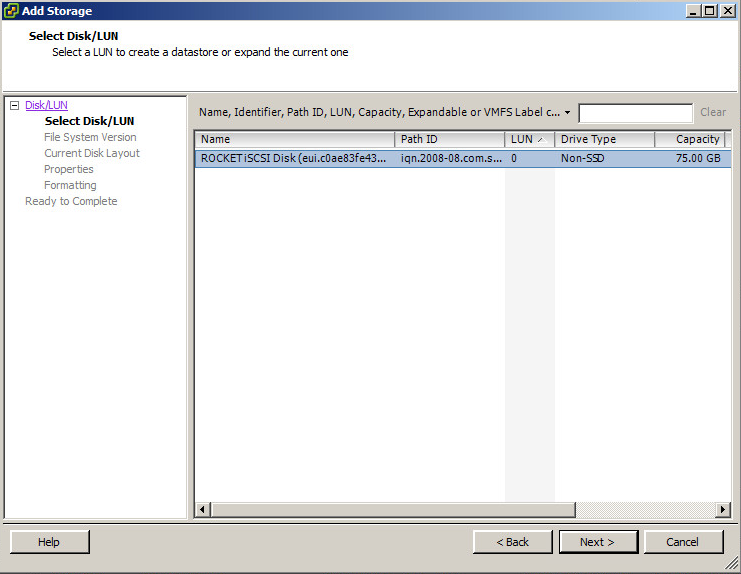 Provided the software iSCSI adapter is configured correctly you should see ROCKET iSCSI Disk select this and click Next. Depending on your requirements click VMFS-5. 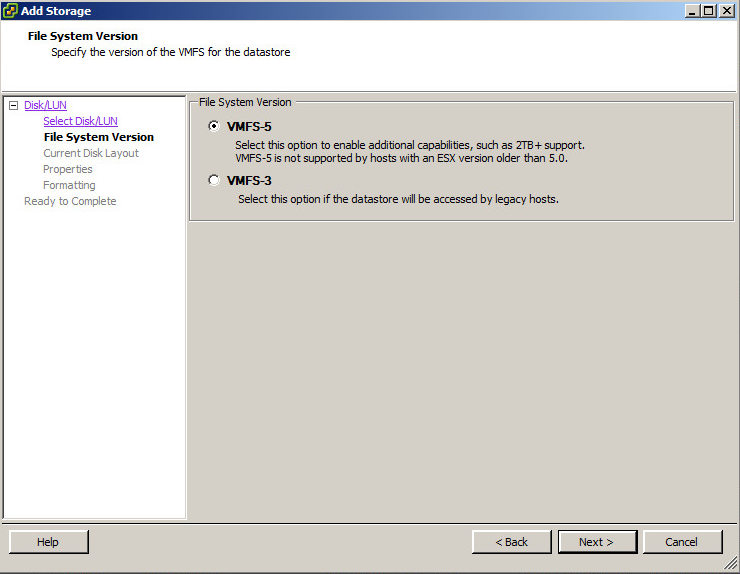 Version 5 offers many improvements over VMFS-3 for full details using this VMware Documentation link http://pubs.vmware.com/vsphere-50/index.jsp?topic=%2Fcom.vmware.vsphere.storage.doc_50%2FGUID-7552DAD4-1809-4687-B46E-ED9BB42CE277.html click Next. Name the Datastore and click Next. Choose Maximum Available Size and click Next. Click Finish on the confirmation page. The datastore should now appear as an available storage location for that host. Right click on Cluster01 and select Browse Datastore, and you should be able to view the files and folders on the datastore. 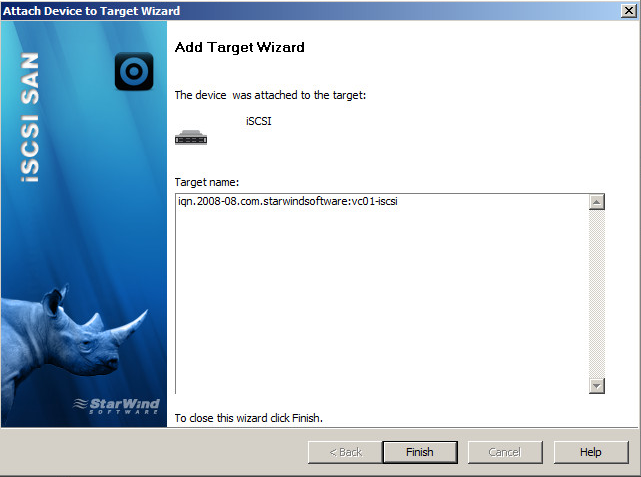 If you return to the StarWinds Management Console you should be able to view the active iSCSI Session by clicking on Targets and then iSCSI Sessions.